Come September, ChrysCapital Investment Advisors India Pvt. Ltd, arguably India’s most successful private equity (PE) investment firm, will hit the road to raise a new fund—its seventh in 16 years. The nerve centre for the coming campaign will not be Suite 101 at The Oberoi in New Delhi, until recently ChrysCapital’s headquarters. “My job is to play the role Ashish (ChrysCapital founder Ashish Dhawan) played earlier," says the 41-year-old Shroff, who took charge as lead partner this January. It isn’t an easy act to follow. Dhawan, who founded the firm in 1999, held sway over the country’s PE industry for over a decade before stepping down four years ago to pursue a second career in philanthropy. Under him, ChrysCapital grew from a modest $64 million fund to $2.25 billion in assets under management. Shroff’s first big assignment after taking charge puts him squarely in one of Dhawan’s core areas of expertise—getting global limited partners (investors in PE funds) to write large cheques for the new fund. Talk about the seventh fund has been around in the market for well over a year. Shroff is tight-lipped on the details, but a person with direct knowledge of the development says that the target corpus is $600-700 million. Shroff and his core team—partners Sanjiv Kaul, Sanjay Kukreja and Ashley Menezes—are expected to formally kick off the fund-raising process in September. “A few informal commitments have already come in from limited partners," added the person, who did not want to be identified. The firm will enter the market to raise Fund VII at a time when the chips are somewhat down for India’s PE industry. Out of the nearly $100 billion invested in the country since 1998, the industry has delivered less than $50 billion in returns, according to data compiled by Chennai-based research firm Venture Intelligence. Fund managers have been under pressure from limited partners to show returns, especially over the past couple of years. Most new funds that are currently on the road, even those led by veteran money managers, are taking longer to close fund-raising. The industry’s poor track record in delivering returns can partly be blamed on the 2008 global financial crisis that all but wiped out the exit market. However, it also has to do with fund managers deploying money too fast in capital-intensive sectors such as infrastructure, mining and metals, telecom and manufacturing at high entry valuations. Subsequently, investments slowed. 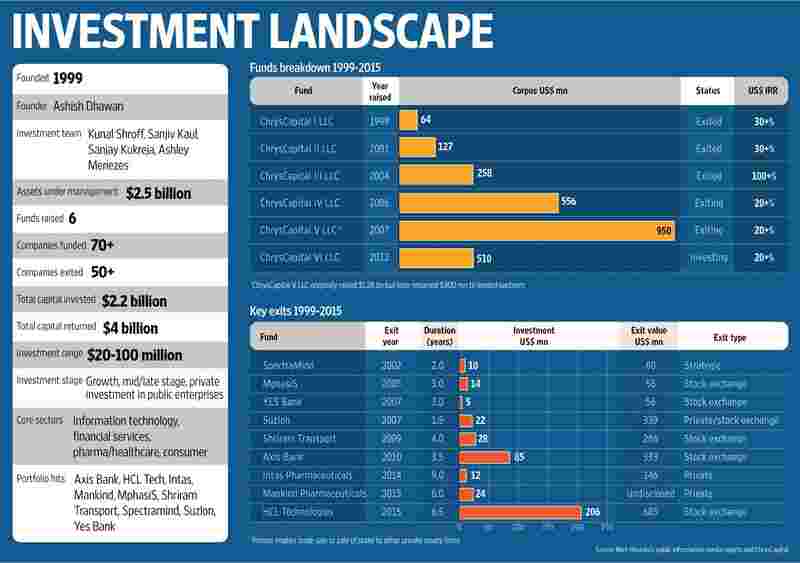 The year 2012, in particular, saw investments decline 15% to $8.9 billion. Since then, the market has recovered somewhat—last year, the industry clocked a record $10.9 billion in fresh investments. Still, the environment remains tough. By some estimates, the number of PE investors currently active in India has shrunk to one-third in the past couple of years. On the one hand, this means that there are fewer players to compete with for deals. However, it also implies that the limited partners have become far more selective about committing fresh capital to the Indian market. “A lot of people have fallen by the wayside but the ones that are still standing have clear and differentiated strategies. People are also happy doing fewer deals," says Dhawan, who continues to closely monitor both ChrysCapital’s and the overall industry’s progress. Global buyout shops such as the Blackstone Group LP, APAX Partners LLP and TPG Capital LP have retreated from the mid-market segment and are now more focused on $100 million-plus deal ticket sizes in which they can acquire a controlling stake. The mid-market segment, where the deal ticket sizes range between $20 million and $50 million, is now occupied by a slew of new players such as Kedaara Capital Investment Managers Ltd, fronted by former Temasek Holdings Pte. Ltd’s India chief Manish Kejriwal, and Multiples Alternate Asset Management Pvt. Ltd, led by former ICICI Venture Funds Management Co. Ltd managing director Renuka Ramnath. Unlike many of his peers, Shroff can take comfort from the fact that so far ChrysCapital has outperformed the market. Against the $2.2 billion invested by the firm to date from its six funds, it has already realized $4 billion in returns. It claims an aggregate return of more than 30% in dollar terms on investments across all funds. “Just in the last year-and-a-half, we have returned over $1 billion in gross proceeds across funds," he says. The big exit from this period is the sale of its 11% stake in Delhi-based pharmaceuticals company Mankind Pharma Ltd to investment firm Capital International Inc. for a reported $215 million. It had invested $24 million in 2007. The Mankind Pharma exit, which is pending final regulatory approvals, will be the last from the firm’s fourth fund, raised in 2006 with a $556 million corpus. “Thus, four funds will have successfully been closed out with strong returns," says Shroff. The firm has also been exiting the $960 million Fund V, its largest to date and the last that Dhawan led. The principal corpus has already been returned to the limited partners from the exits completed so far. The firm’s limited partners in past funds have included institutions such as Harvard Management Co (HMC), which manages Harvard University’s endowment, Chicago-based private equity investor Adams Street Partners LLC, which manages over $26 billion in assets, and Hong Kong-based Asia Alternatives Management LLC that specializes in both direct and fund-of-fund investments. HMC, Adams Street Partners and Asia Alternatives declined to comment for this story. A strong exit run will be useful when Shroff and his core team—partners Sanjiv Kaul, Sanjay Kukreja and Ashley Menezes—go to market at the end of this quarter. What will count more with limited partners is the stability of the new partnership that he now helms. In the four years since Dhawan’s departure, the partnership has already been rocked once and as recently as last August. Internal differences saw Gulpreet Kohli, one of the firm’s six remaining partners and the lead for fund-raising, quit in a huff. The exact reasons for his departure are not known. Kohli could not be reached for comments as of press time. None of the partners MintAsia spoke to for this story was willing to elaborate on Kohli’s exit. “His departure was unfortunate but we had enough stability in the team and the core group to withstand the change," says Sanjay Kukreja, the youngest among the four remaining partners and internally dubbed the “strategist" in the team. Kohli’s exit, however, precipitated the firm’s transition from the collective leadership model it had adopted following Dhawan’s departure. “The collective model worked initially and we did well on deals. But there were gaps that needed to be plugged and it made sense for one of us to take charge as lead partner," says Sanjiv Kaul, the oldest in the group, who has taken over the mentoring role that Dhawan played earlier. So, last December, at the firm’s annual review meeting, Shroff was elected lead partner. In his new role, he takes charge of fund-raising and investor relations and, importantly, will be responsible for shaping ChrysCapital Version 2.0. Version 2.0, says Dhawan, is already better than the previous version. “They have a sharper strategy, a much more proactive approach to creating new deals," he says. The new version has already been in the making for four years, since mid-2011, when Dhawan announced his decision to step down. Though he continued to be in charge as senior managing director till July 2012, he had effectively handed over key responsibilities to the new team. At the time, apart from the four current partners, the team included Kohli and Ravi Bahl, who led financial services investments (he continues with the firm in an advisory role), and their first assignment was to raise Fund VI, which had a target corpus of $510 million. Prior to fund-raising, Dhawan had already informed the limited partners that he would not be involved in Fund VI’s investments, though he did invest in the fund as a limited partner himself. The fund was raised in six months and in an environment that was not particularly attractive for Indian PE. Fund VI has made nine investments so far. These include investments in City Union Bank Ltd, Au Financiers (India) Pvt. Ltd, LiquidHub Inc. (its first overseas investment), Magma FinCorp Ltd and Torrent Pharmaceuticals Ltd.
“We have maybe another 5-6 investments to make. Based on the current plans, it should be fully invested by the middle of next year," says Shroff. Much of Version 2.0 has been in play through the Fund VI investment run. To begin with, the team decided to stick to a smaller fund corpus in the light of their experience with Fund V, which initially raised $1.26 billion. It was an iconic fund—the first billion-dollar fund to be raised out of India—but later proved to be too large for a market of India’s size. “It is always good to size yourself appropriate to the market. Then it’s easy to outperform. The fifth fund is the one I am least proud of, even though it will still beat the market on returns," says Dhawan. The fund was later cut to $960 million and the surplus capital was given back to limited partners—again a first in the Indian PE industry. Taking a cue from its mistakes in Fund V, in the current fund, ChrysCapital has reverted to its earlier investment strategy of focusing on $40-50 million deals in mid-market companies. “There just isn’t enough depth in this market for $100 million-plus deals, though we still look at those selectively," says Shroff. It also sharpened its sector focus, throwing out the capital-intensive manufacturing and infrastructure sectors and, instead, going deeper into information technology, pharma and healthcare, financial services and consumer businesses. Former Ranbaxy Laboratories Ltd executive Sanjiv Kaul, who Dhawan brought on board in 2004, leads investments in pharma, healthcare and consumer businesses. Kukreja leads investments in financial services and information technology. Out of the two sectors the firm threw out initially, manufacturing is back on the table on a selective basis. One big change in the way it now tracks sectors is the deeper and wider focus in its sectors of choice. “We’ve expanded the sandbox in each sector," says Shroff, who doesn’t head any particular sector but works as a backup partner to each sector lead. “In pharma, for instance, we’ve normally stuck to formulations. Now we’re also looking at areas such as CRAMS, diagnostics and specialty hospitals," says Kaul. CRAMS is short for contract research and manufacturing services. Similarly, in information technology, where the firm has typically picked up minority stakes, it is now evaluating deals that involve controlling stakes. It continues to drive deals in listed companies, also known as PIPEs (private investment in public enterprises), a strategy that has been successful before. ChrysCapital, under Dhawan, is credited with taking PIPEs mainstream in India’s PE industry. It became a key part of the firm’s investing strategy in 2001, starting with the acquisition of a 7.5% stake in Mumbai-based information technology services company Mphasis BFL Ltd (acquired by US-based Electronic Data Systems Corp. in 2006). The $14 million investment in the company earned it a nearly 5X (five times the original investment) return after three years. Today, as far as PIPEs are concerned, ChrysCapital is one of the few PE firms active in India that has the flexibility to invest up to 50% of its corpus in listed companies. Limited partners don’t like their money to be invested in PIPEs and generally cap such investments in most funds at 10%. ChrysCapital’s track record with PIPEs allows it to be an exception. For instance, this year, it exited Delhi-based IT services company HCL Technologies Ltd with a more than a 3X return on an aggregate investment of $206 million. “One of the reasons we’ve done well relative to others is that we have a very analytical, data-driven approach to deal-making," says Kukreja, who also leads a two-member “ideas team" within the firm that tracks 250-300 companies across sectors every quarter and throws up emerging trends that the firm can evaluate. The most defining aspect of Version 2.0, however, is not the firm’s investing strategy but the character of the partnership itself. Dhawan’s exit inherently altered the structure of the partnership. “It is a more equal partnership today in terms of ownership," says Kaul. Prior to his departure, Dhawan, as founder, owned a significantly higher share of the partnership and the rest was distributed among the remaining partners. In the current structure, all partners have a nearly equal share. That allows the partnership to operate more as a collective, despite having elected Shroff as a lead partner. “We employ a collaborative approach. That’s how we like to run things. The difference between the others and myself is that mine is the neck to catch if things go south," says Shroff with a laugh. The collaborative approach is what differentiates Shroff from his mentor. While Dhawan, by virtue of being founder (he founded the firm with college buddy Raj Kondur, who quit early in its life), was clearly the first among equals, Shroff has grown up in the firm as one of the boys. His chosen operating style, therefore, is to support, enable and empower. Even under Dhawan, ChrysCapital was always fairly collaborative. Unlike its peers, the entire investment team is an integral part of the investment committee. Every Monday morning, the team, right from analysts to directors and partners, sits in on the investment committee meeting and discuss deals. Shroff has taken the collaborative approach further. For instance, against the earlier practice where only partners could vote on deals, now directors, who constitute the second line of leadership, also enjoy a partial vote. When the time comes, such practices, along with the sense of ownership in the firm—all investment professionals in the firm, in addition to the partners, have equity—will contribute to holding ChrysCapital in good stead as it readies for the next decade.